Conjuring fear of Nazism and anti-Semitism, Jews recoil from the thought that Judaism might be a race, but medical geneticist Harry Ostrer insists the ‘biological basis of Jewishness’ cannot be ignored. 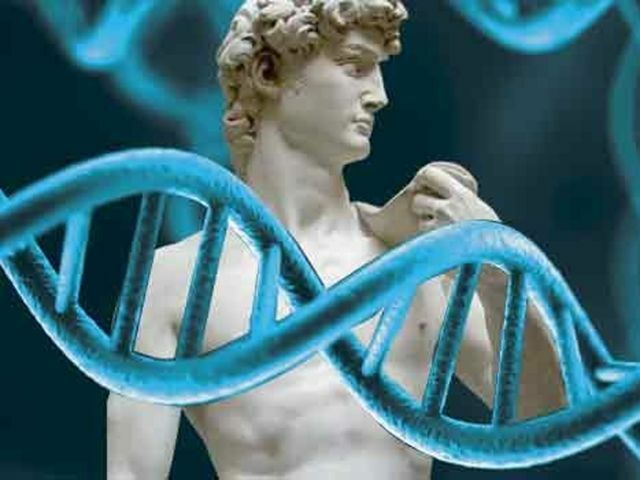 In his new book, Legacy: A Genetic History of the Jewish People, Harry Ostrer, a medical geneticist and professor at Albert Einstein College of Medicine in New York, claims that Jews are different, and the differences are not just skin deep. Jews exhibit, he writes, a distinctive genetic signature. Considering that the Nazis tried to exterminate Jews based on their supposed racial distinctiveness, such a conclusion might be a cause for concern. But Ostrer sees it as central to Jewish identity. Geneticists have long been aware that certain diseases, from breast cancer to Tay-Sachs, disproportionately affect Jews. Ostrer, who is also director of genetic and genomic testing at Montefiore Medical Center, goes further, maintaining that Jews are a homogeneous group with all the scientific trappings of what we used to call a race. For most of the 3,000-year history of the Jewish people, the notion of what came to be known as Jewish exceptionalism was hardly controversial. Because of our history of inmarriage and cultural isolation, imposed or self-selected, Jews were considered by gentiles (and usually referred to themselves) as a race. Scholars from Josephus to Disraeli proudly proclaimed their membership in the tribe. Ostrer explains how this concept took on special meaning in the 20th century, as genetics emerged as a viable scientific enterprise. Jewish distinctiveness might actually be measurable empirically. In Legacy, he first introduces us to Maurice Fishberg, an upwardly mobile Russian-Jewish immigrant to New York at the fin de siècle. Fishberg fervently embraced the anthropological fashion of the era, measuring skull sizes to explain why Jews seemed to be afflicted with more diseases than other groups — what he called the peculiarities of the comparative pathology of the Jews. It turns out that Fishberg and his contemporary phrenologists were wrong: Skull shape provides limited information about human differences. But his studies ushered in a century of research linking Jews to genetics. Legacy may cause its readers discomfort. To some Jews, the notion of a genetically related people is an embarrassing remnant of early Zionism that came into vogue at the height of the Western obsession with race, in the late 19th century. Celebrating blood ancestry is divisive, they claim: The authors of The Bell Curve were vilified 15 years ago for suggesting that genes play a major role in IQ differences among racial groups. Furthermore, sociologists and cultural anthropologists, a disproportionate number of whom are Jewish, ridicule the term race, claiming there are no meaningful differences between ethnic groups. For Jews, the word still carries the especially odious historical association with Nazism and the Nuremberg Laws. They argue that Judaism has morphed from a tribal cult into a worldwide religion enhanced by thousands of years of cultural traditions. Is Judaism a people or a religion? Or both? The belief that Jews may be psychologically or physically distinct remains a controversial fixture in the gentile and Jewish consciousness, and Ostrer places himself directly in the line of fire. Yes, he writes, the term race carries nefarious associations of inferiority and ranking of people. Anything that marks Jews as essentially different runs the risk of stirring either anti- or philo-Semitism. But that doesnt mean we can ignore the factual reality of what he calls the biological basis of Jewishness and Jewish genetics. Acknowledging the distinctiveness of Jews is fraught with peril, but we must grapple with the hard evidence of human differences if we seek to understand the new age of genetics. On the one hand, the study of Jewish genetics might be viewed as an elitist effort, promoting a certain genetic view of Jewish superiority, he writes. On the other, it might provide fodder for anti-Semitism by providing evidence of a genetic basis for undesirable traits that are present among some Jews. These issues will newly challenge the liberal view that humans are created equal but with genetic liabilities. In traversing this minefield of the genetics of human differences, Ostrer bolsters his analysis with volumes of genetic data, which are both the books greatest strength and its weakness. Two complementary books on this subject — my own Abrahams Children: Race, Identity, and the DNA of the Chosen People and Jacobs Legacy: A Genetic View of Jewish History by Duke University geneticist David Goldstein, who is well quoted in both Abrahams Children and Legacy — are more narrative driven, weaving history and genetics, and are consequently much more congenial reads. The concept of the Jewish people remains controversial. The Law of Return, which establishes the right of Jews to come to Israel, is a central tenet of Zionism and a founding legal principle of the State of Israel. The DNA that tightly links Ashkenazi, Sephardi and Mizrahi, three prominent culturally and geographically distinct Jewish groups, could be used to support Zionist territorial claims — except, as Ostrer points out, some of the same markers can be found in Palestinians, our distant genetic cousins, as well. Palestinians, understandably, want their own right of return. That disagreement over the meaning of DNA also pits Jewish traditionalists against a particular strain of secular Jewish liberals that has joined with Arabs and many non-Jews to argue for an end to Israel as a Jewish nation. Their hero is Shlomo Sand, an Austrian-born Israeli historian who reignited this complex controversy with the 2008 publication of The Invention of the Jewish People. Sand contends that Zionists who claim an ancestral link to ancient Palestine are manipulating history. But he has taken his thesis from novelist Arthur Koestlers 1976 book, The Thirteenth Tribe, which was part of an attempt by post-World War II Jewish liberals to reconfigure Jews not as a biological group, but as a religious ideology and ethnic identity. Although scholars challenged Koestlers and now Sands selective manipulation of the facts — the conversion was almost certainly limited to the tiny ruling class and not to the vast pagan population — the historical record has been just fragmentary enough to titillate determined critics of Israel, who turned both Koestlers and Sands books into roaring best-sellers. Fortunately, re-creating history now depends not only on pottery shards, flaking manuscripts and faded coins, but on something far less ambiguous: DNA. Ostrers book is an impressive counterpoint to the dubious historical methodology of Sand and his admirers. And, as a co-founder of the Jewish HapMap — the study of haplotypes, or blocks of genetic markers, that are common to Jews around the world — he is well positioned to write the definitive response. When the human genome was first mapped a decade ago, Francis Collins, then head of the National Genome Human Research Institute, said: Americans, regardless of ethnic group, are 99.9% genetically identical. Added J. Craig Venter, who at the time was chief scientist at the private firm that helped sequenced the genome, Celera Genomics, Race has no genetic or scientific basis. Those declarations appeared to suggest that race, or the notion of distinct but overlapping genetic groups, is meaningless. But Collins and Venter have issued clarifications of their much-misrepresented comments. Almost every minority group has faced, at one time or another, being branded as racially inferior based on a superficial understanding of how genes peculiar to its population work. The inclination by politicians, educators and even some scientists to underplay our separateness is certainly understandable. But its also misleading. DNA ensures that we differ not only as individuals, but also as groups. Both the human genome project and disease research rest on the premise of finding distinguishable differences between individuals and often among populations. Scientists have ditched the term race, with all its normative baggage, and adopted more neutral terms, such as population and clime, which have much of the same meaning. Boiled down to its essence, race equates to region of ancestral origin. Ostrer has devoted his career to investigating these extended family trees, which help explain the genetic basis of common and rare disorders. Today, Jews remain identifiable in large measure by the 40 or so diseases we disproportionately carry, the inescapable consequence of inbreeding. He traces the fascinating history of numerous Jewish diseases, such as Tay-Sachs, Gaucher, Niemann-Pick, Mucolipidosis IV, as well as breast and ovarian cancer. Indeed, 10 years ago I was diagnosed as carrying one of the three genetic mutations for breast and ovarian cancer that mark my family and me as indelibly Jewish, prompting me to write Abrahams Children. Like East Asians, the Amish, Icelanders, Aboriginals, the Basque people, African tribes and other groups, Jews have remained isolated for centuries because of geography, religion or cultural practices. Its stamped on our DNA. As Ostrer explains in fascinating detail, threads of Jewish ancestry link the sizable Jewish communities of North America and Europe to Yemenite and other Middle Eastern Jews who have relocated to Israel, as well as to the black Lemba of southern Africa and to Indias Cochin Jews. But, in a twist, the links include neither the Bene Israel of India nor Ethiopian Jews. Genetic tests show that both groups are converts, contradicting their founding myths. Why, then, are Jews so different looking, usually sharing the characteristics of the surrounding populations? Think of red-haired Jews, Jews with blue eyes or the black Jews of Africa. Like any cluster — a genetic term Ostrer uses in place of the more inflammatory race — Jews throughout history moved around and fooled around, although mixing occurred comparatively infrequently until recent decades. Although there are identifiable gene variations that are common among Jews, we are not a pure race. The time machine of our genes may show that most Jews have a shared ancestry that traces back to ancient Palestine but, like all of humanity, Jews are mutts. About 80% of Jewish males and 50% of Jewish females trace their ancestry back to the Middle East. The rest entered the Jewish gene pool through conversion or intermarriage. Those who did intermarry often left the faith in a generation or two, in effect pruning the Jewish genetic tree. But many converts became interwoven into the Jewish genealogical line. Reflect on the iconic convert, the biblical Ruth, who married Boaz and became the great-grandmother of King David. She began as an outsider, but you dont get much more Jewish than the bloodline of King David! Although Jews make up less than 3% of the population, they have won more than 25% of the Nobel Prizes awarded to American scientists since 1950. Jews also account for 20% of this countrys chief executives and make up 22% of Ivy League students. Psychologists and educational researchers have pegged their average IQ at 107.5 to 115, with their verbal IQ at more than 120, a stunning standard deviation above the average of 100 found in those of European ancestry. Like it or not, the IQ debate will become an increasingly important issue going forward, as medical geneticists focus on unlocking the mysteries of the brain. Is it good for the Jews to be exploring such controversial subjects? We cant avoid engaging the most challenging questions in the age of genetics. Because of our history of endogamy, Jews are a goldmine for geneticists studying human differences in the quest to cure disease. Because of our cultural commitment to education, Jews are among the top genetic researchers in the world. As humankind becomes more genetically sophisticated, identity becomes both more fluid and more fixed. Jews in particular can find threads of our ancestry literally anywhere, muddying traditional categories of nationhood, ethnicity, religious belief and race. But such discussions, ultimately, are subsumed by the reality of the common shared ancestry of humankind. Ostrers Legacy points out that — regardless of the pros and cons of being Jewish — we are all, genetically, in it together. And, in doing so, he gets it just right. Next Post ¿Por qué a tantos judíos les molesta Purim?